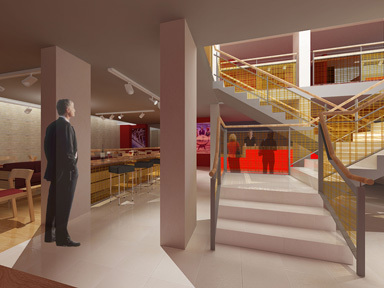 Lawrence:King were commissioned to carry out a feasibility study for the refurbishment of the existing foyer spaces of The Cambridge Arts Theatre in June 2007. This lead to undertaking the detailed design and following extensive negotiations with the local authority and other interested groups Lawrence:King successfully obtained detailed Planning Permission and Listed Building Consent for the proposals in Autumn 2008. The proposals incorporate a newly acquired neighbouring shop unit and rationalise the existing foyer interiors and fire escape routes to gain much needed extra public space that allow the entrance to be transformed. In addition to new box office, café, bars, and restaurant areas there will be a new flexible basement bar and entertainment venue, that provides the potential to increase the amount of valuable revenue earning space. The project has now entered the fund-raising stage.